Langeroo is pleased to announce the arrival of its first Windows, launching today on Windows 8 and Windows RT, including the new Surface tablet from Microsoft. Word Bank brings a combination of two of our most popular activities available in our online subscription – Word Bank and Flash Cards – to the home market. Langeroo Word Bank is optimised for touch but works equally as well with a traditional keyboard and mouse. 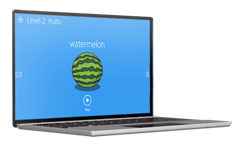 Langeroo English Word Bank features a collection of over 470 English words organized in relevant, useful and exciting topics; designed to help your child to learn and develop their English language skills in a fun and engaging way. Each word has a matching picture, a sound and a written word. This will encourage your child to progress from learning English through pictures, to learning through sound, to learning through reading. Split into three levels of learning, your child can progress through the course at their pace. Each level can be purchased separately (we offer the first two introduction topics for FREE!) or you can save money by purchasing all three topics as a collection. Level 1 teaches the basics – numbers, the body, colours and shapes. Level 2 is an introduction to surroundings – teaching about the city, the school, animals and food. Level 3 introduces activities, seasons and describing feelings. Langeroo was developed with primary teachers in England and Wales and is based on the foundations of the UK National Curriculum. Our software is already in use by teachers in schools worldwide. For more information, please check out the product page here.